I remember the mid-1990s fondly, and that may be because I have forgotten a lot of the horrible times of middle school and early high school, and remembered the good ones. I remember going to the game store and seeing boxes and boxes of new CCGs after Magic: The Gathering exploded. The original Netrunner was among them, and while I did manage to pick up a starter deck of it I never got into it or managed to accrue anything like a collection. For a long time now, the game has been an eBay staple and a highly sought-after item for collectors and lovers of the game alike. Now, finally in 2012, a reprint is come. Thanks to the original designer Richard Garfield and some tinkering from Lukas Litzinger, it has been revived in the form of Android: Netrunner. 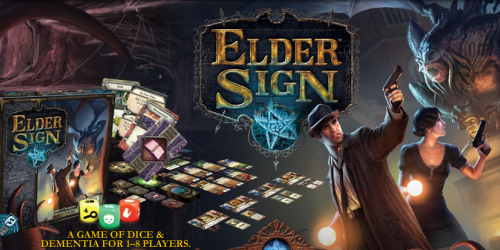 This is an addition to Fantasy Flight’s stable of LCGs including other big properties like: A Game of Thrones: The Card Game, Warhammer: Invasion, and The Lord of the Rings: The Card Game. As with Fantasy Flight’s other LCGs (Living Card Games), expansion packs are released regularly containing 60 new cards to add to the core set. So far two expansion packs, called “data packs”, have been released: What Lies Ahead and Trace Amount, with at least three more coming in this series titled rather obviously: “The Genesis Cycle”. If the pattern continues as with the other LCGs, we can also expect larger expansions to be released every so often. You may also be wondering what the name “Android” is doing attached to the well-known name of the classic CCG. In 2008, Fantasy Flight Games published Android, a game about crime and deduction set in a dystopian, cyberpunk future. The game’s reception was mixed, but I believe the consensus was that it was an interesting game that was too cumbersome and time-consuming for most groups. Recently, FFG has put out another game, Infiltration (by Donald Vaccarino of Dominion fame), and a few novels set in the Android universe. So, it’s a thing now. FFG has begun fleshing it out and making their own brand of cyberpunk, which turns out to be not bad…not bad at all. The game comes in a full-size square box, just like any board game containing all kinds of pieces, wooden bits, cards, etc. However, this game only has two major components in it: cards and counters. The price reflects this, which is great. It is not priced the same as a game containing lots of expensive bits. What you get are a little over 250 cards and one thick cardboard counter sheet. While it takes up far too much shelf space for what it is, um, the box is pretty. Upon opening the box my first thought was: “that is a lot of cards!” As a compulsive card-sleever, I spent the first ten or fifteen minutes just sleeving the cards, and it seemed to take forever. The card quality is very nice, with no borders on the cards just artwork right to the edges. Some people will not sleeve, and that’s fine I won’t judge you…I’m just going to call Game Protective Services if I find out about it. 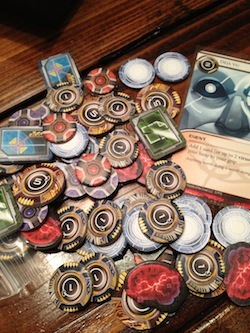 Seriously though, I expect Android: Netrunner sets to see a lot of play. This is because the game is simply rich, engrossing, and fun. The only way I could see someone not liking this game is if they find it too confrontational, too complex, or they do not like the theme. Let me tell you more about the game and you can decide if it sounds awesome or not. I think it is fair to say that part of the standard model for board and card games is to have each player start out pretty much the same and have the same actions available to them, and the path each player takes is really the only difference. 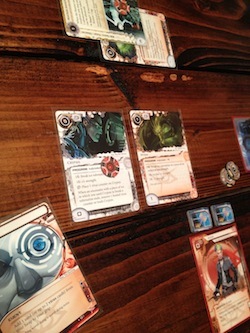 In Android: Netrunner, this is not true: both sides play almost completely differently. What’s really interesting about the asymmetry in this game is that both sides actually have the exact same goal, which is to score seven “agenda points”. Asymmetrical games are fascinating if done well, for another great asymmetrical game take a look at Andean Abyss from GMT Games. In Andean Abyss there are four factions that all play slightly differently, and they all have different win conditions which leads to interesting interactions. 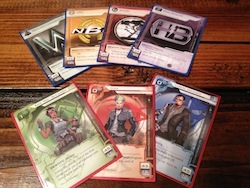 In Android: Netrunner, the essential idea of the game can be summed up like this: the runner wants to steal the corporation’s agendas, the corporation wants to keep agendas from the runner and score them for itself. That’s basically it! The rub is that there are lots of tactics each side uses to achieve their goal and keep the other player from theirs. The main way corps keep their agendas away from the runner is through “ice”, programs that protect the corporation’s servers. Here is where one of the most brilliant strokes was made in regards to the new release: everything the corp controls is on a server. Your hand? a server (the HQ). The deck? Server (R&D). Discard pile? Archives server. Those are the corp’s central servers, and then anything installed outside of that, the agendas and assets, are going to be on remote servers. Since everything the corp owns is on a server, it can all be protected by ice. The runner is a different bird. Runners have faction-specific identity cards that give them flavor and a special ability (I’ll explain the factions a little later). He or she cares not for ice, and so getting through the ice to the delicious agendas underneath is a primary concern. The runner does not have any servers, the runner has a “rig” where they maintain Programs, Hardware, and Resources. Programs and Hardware are self-explanatory mostly, resources are more of a catch-all for things that benefit the runner from the thematic game world: jobs, contacts, special access, etc. The Programs a runner installs will primarily be “icebreakers”, software that can interact with and break subroutines on the corporation’s ice programs. Now, I’m starting to explain some things about the most key interaction in the game: the run. The whole game hinges on the run, it is named after the run, the run is the lifeblood and the purpose. So, what is the run? Sorry, had to do it. Ok, so in the course of the game each player gets a certain number of “clicks” which is the game term for actions that they can take. Most actions will cost “credits”: the game currency and primary resource for both the runner and the corporation. Nothing much gets done without credits, and getting cash flow is a big part of a successful strategy. The corporation, by default, gets three clicks per turn and the runner four. This imbalance in actions is evened out by the fact that the corporation gets to draw a card at the beginning of their turn, the runner does not (drawing a card costs one click). 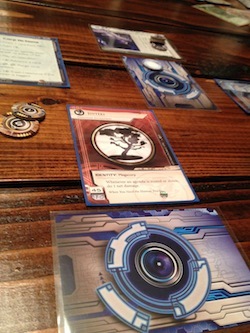 During the course of play, the corporation will try to install agendas on remote servers and advance them, ultimately getting enough advancement tokens on them to complete them. That sounds a lot easier than it is. During that same course of play, the runner will probe the corporation’s defenses for weaknesses, install icebreakers, and generally gear up to make runs. One important thing to note before I go on: the corporation plays all cards face-down (except for Operations cards that take place and then are discarded), and the runner plays cards face-up. This is important because it adds a bluffing and deduction element to the game. When it is the runner’s turn and they want to make a run, he or she can spend a click to either play a card where making a run is part of resolving that card’s effect or simply declare they are going to run on a server. If there isn’t any ice on the server, the runner gets access to it right away; this is generally bad for the corporation (unless they are hoping to spring a trap asset on the runner). If there is ice, then the corporation has to decide to “rez” that first piece of ice, which means they pay the activation cost in credits and then flip the ice face-up. The runner must always deal with the first piece of ice; after that, they can decide to “jack out” before they meet subsequent ice or even before they access the server, but they must encounter that first piece of ice. When a runner encounters ice, he or she can use installed icebreaker programs to engage the ice and break the subroutines that it will run unless the runner disables them. This kind of interaction between cards is not only interesting and unique, it is highly thematic. The runner actually feels like they are hacking a server, the corporation feels like they are protecting their assets and agendas with expensive and potentially deadly programs. Often times both sides will need a good supply of credits in order to hack/defend effectively. If the runner accesses a server and finds an agenda, they score it immediately and the agenda points of that card are added to their total. If he or she finds a card that can be trashed (indicated by a little trash can in the corner with a value on it) they can pay that value in credits to send the card to the corporation’s discard pile. This applies whether the runner accessed R&D, HQ, Archives or any remote server. Other cards are just returned to where they were. Other clicks for both corporation and runner will be spent on getting credits (1 credit per click), playing cards (installing them or playing events and operations), drawing cards, and a few others. In the core set there are three runner factions and four corporation factions. For the runners you’ve got Anarch, Criminal, and Shaper. The Corporations are Jinteki, Haas-Bioroid, NBN, and Weyland. Each has certain features and drawbacks, and I’ll leave that up to you to do some research around the interwebs or at the table and see what those are perceived to be. In addition to the faction-specific cards included in the deck are generic cards that can be added to any faction deck. This brings to me to another very interesting aspect of Android: Netrunner which is the deck-building. At first, you might want to just play around with each faction by itself and see what it can do and doesn’t do so well, then you can start to mix cards from various factions. Here are the basic deckbuilding rules: you have to pick an identity and your deck must be based on that faction. On each identity card there is a set of numbers, in the core set they are all 45 and 15. 45 is the minimum number of cards that must be in the deck, and 15 is the amount of “influence” from other faction’s cards that may be in the deck. On each card that is not an agenda there are up to five pips that indicate the influence value of the card, cards with an influence indicator but no influence pips are free. That’s about it. It’s pretty simple to deck-build now, but it will become more involved as more and more cards are added to the mix with each expansion. I like the rather restricted feel of the deck-building rules right now, as in the age of CCGs it could be really daunting and time-consuming to build a deck using whatever you wanted if you had a decent-sized collection. Some people revel in the deck construction aspects though, but I do have some trepidation about the future when there are enough cards where I have to agonize about whether to include this or that card and worry about the old size vs. efficiency problem. If you haven’t guessed by now, I’m very impressed by this game. Especially after face-palming for a few years now for missing the original in the mid-90s when I was still caught up in Magic, I felt like I have been given a second chance to enjoy this amazing design. 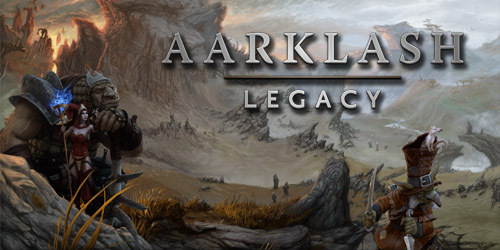 The game is so thematic, while at the same time offering such rich game-play and interaction, that I feel this is easily one of the best 2-player games of 2012, if not one of the best games overall from last year. The bluffing aspect makes the game tense and exciting every turn, the scramble for resources and the meaningful use of every click makes game-play very tight, and the minds of the opponents factor in to add meta-game psychology aspects. It’s great! I do have a few reservations, but nothing that would make me stop playing the game. One of them being that since it is a card game you can always suffer from bad draws. Some people will say that it is all skill and you just have to have enough skill to play whatever cards you get in the right way, but that is rubbish. You have to have the knowledge AND the cards to make it work. A runner won’t be able to run with much effectiveness if they don’t draw icebreakers, and a corporation will really be screwed if they don’t draw ice. If you are playing as corp and you don’t get ice in your first hand, you are probably going to want to take a mulligan and draw again, especially if your HQ is going to be unprotected. If your HQ has no protection, a runner can snag agendas right out of your hand. Another thing that can be frustrating on both sides is that if you are not getting cards that help generate cash flow, being broke is no fun at all. A broke corporation can’t rez ice, a broke runner can beef up icebreakers on runs, things go flat. Now, there will be lulls for each side where you get a bunch of credits, spend them, and then spend a few turns figuring out where the next payday will come from, this is part of the flow of the game. Corps will have assets that generate money each turn or Operations cards, where runners will have resources like jobs or less-reputable means of income. Another thing about bad card draws is when you play the corporation and have a hand full of agendas. On the one hand you don’t have enough ice or resources to put them on remote servers and score them in any reasonable amount of time, and on the other hand you don’t want to draw new cards and have to discard the agendas into the archives where the runner can make one successful run and win the game (which might have happened to me once…and the runner might have scored 14 agenda points from archives. Whoops.). Corporation players should definitely be warned to ice your archives in case you need to discard agendas. So, the game is great. It is not a crappy re-make, it is an ingenious re-design, re-theming (kind of), and re-print of a great game. I have no qualms about telling anyone who likes 2-player games to pick it up as soon as possible. Enjoy!